HOUSE PRICE RISES are beginning to stabilise across the country as more properties become available to buy on the market, it has been reported. The latest house price report by property website Daft.ie has revealed that house prices rose by 1.3% in the third quarter of 2018. However, parts of the country also saw prices drop over the three-month period, with Cork city in particular experiencing a 0.1% decrease in house prices between June and September. The report also revealed that the average price of properties across the country over the same period was €257,000, 6.6% higher than a year ago. 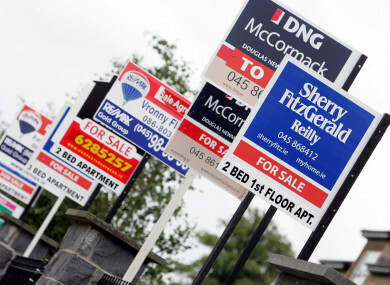 Compared to their lowest point in 2013, house prices nationwide have risen by an average of 56%, or just over €92,000. In Dublin, prices rose by just 0.2% between June and September, the smallest quarterly increase since 2016. A similar trend was also seen in Ireland’s other major cities, with more muted price increases in Galway (1.1%) and Limerick (1.0%), and stable prices in Waterford (0.2% rise) and Cork city. Outside the main cities, house prices rose by 2.2% over the three-month period. Meanwhile, the number of properties available to buy on the market across the country also continued to rise during the third quarter of the year. According to the report, almost 25,000 properties were on sale in September, roughly 1,000 higher than a year previously. The increase was almost entirely driven by Dublin, where the amount of housing stock on the market rose by 40% year-on-year, while the rest of Leinster saw stock increase by 7%. However, availability in Munster and Connacht-Ulster continued to shrink. The report’s author Ronan Lyons, economist at Trinity College Dublin said the latest trends mean Ireland should expect to see more muted inflation in the housing market in coming quarters. “Commentary on the housing market often questions the degree to which the laws of supply and demand apply to it,” he said. Email “House prices beginning to stabilise as parts of the country see price drop during third quarter of 2018”. Feedback on “House prices beginning to stabilise as parts of the country see price drop during third quarter of 2018”.